Mantras of Ganpathy Puja play significant role in individuals’ life as it channelizes initiation of anything in the most fitting and beneficial manner. 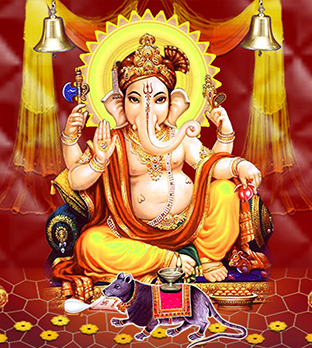 Through blessings of Lord Ganesha, good fortunes come in your life. .
Haridraa, kumkuma, Pooja Akshatta, Pooja Bell, Yagnopavita, Vastra, Agarbathi, Deepam, Pugi Phala, Karpoora, Cup Sambrani, Peetha for Bell, etc. are the main accessory items of Ganpathy Puja. Guaranteed Accuracy in Conduction of Ganpathy Puja that showers blessing of Lord Ganesha in the most befitting manner. Transparent conduction of Ganpathy Puja either in Online or Offline mode that follows all the rituals of Vedas. Inclusion of Pundits and Purohits who are well aware of Ganpathy Puja because they are Gurukul trained Purohits and with them following of all rituals of Ganpathy Puja with utmost Vedic accuracy is ensured. Puja Yagya is the most accommodating and authentic Ganpathy Puja service provider in United States of America, thanks to our credible Vedic services and Gurukul trained Pundits.